In the past week or so I've managed to spend a fair amount of time pottering around in my greenhouse. I'm later than usual getting things sown, but in some ways I don't think that's such a bad thing with our north facing garden. So today I'm going to share what's growing, and in some cases what I'm hoping will start to grow very soon. So let's start with my sweet peas. 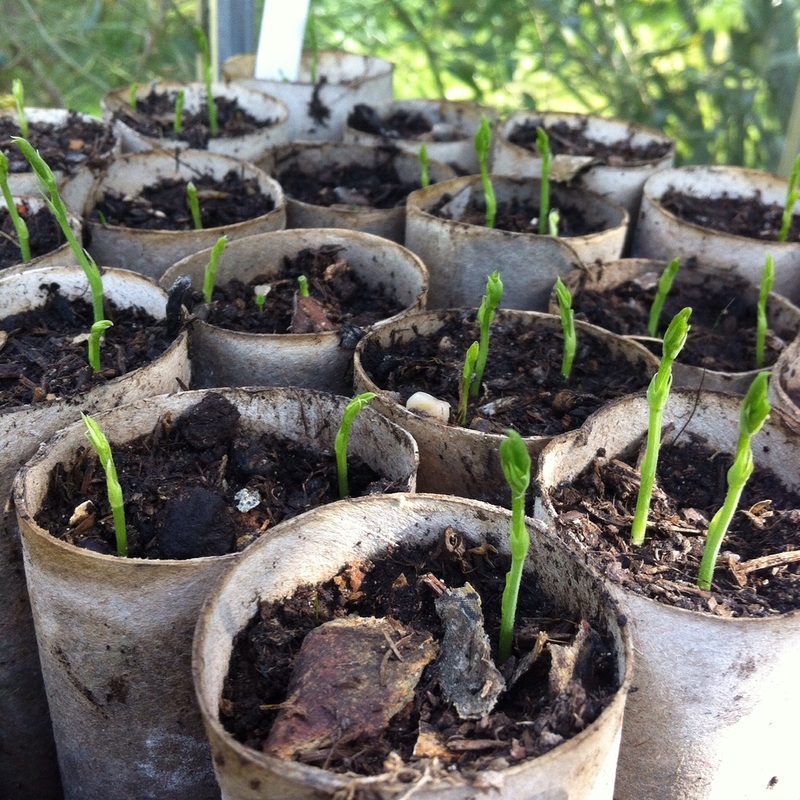 Over the winter I'd been collecting toilet roll and kitchen roll tubes to use as plant pots, as sweet peas like long roots and they're not keen on them being disturbed. Dad had given me a carrier bag of sweet pea pods and it's these that I planted in these tubes. My everlasting sweet peas sort themselves out, which is partly why we get on so well! But it wasn't long before these annuals were springing up, it's so exciting when things start to grow, isn't it? I've also managed to keep a relative of that ginormous geranium of my dad's alive over winter, although I'm not sure it'll grow quite as big for me. So onto some beans. As well as hoarding all those seeds it seems I've also got a thing for those small little brown pots that disintegrate when you plant them out, so I've resolved to use those too. These have got some Purple Teepee dwarf beans in, there's not much sign of life yet, but I'm still hopeful. And talking of seeds, look how many there are in this packet! No wonder I've got loads - these are Pomodoro, a cherry tomato. I've sown some of these, some Gardeners Delight, the last of my favourite Tigerella and some Golden Sunrise too. I've also sown some Pink Brandywine tomatoes but I'm not sure if they'll germinate or not and a couple of cucumbers too. So far the Pomodoro are going well and I don't think the Gardeners Delight are far behind. I'm keeping my fingers crossed for the Tigerellas as I think they were potentially on the edge of expiring. There's nothing yet from the Golden Sunrise, and they're relatively new seeds so perhaps they naturally take a bit longer. I've also acquired some tomatoes from my FIL, I'm not sure what type these are so I've used my ready prepared Lucky Dip labels. However careful I am with my tomatoes, at some point I always forget which is which and until they fruit often there's little way of knowing. If all the seeds I've sown germinate (and survive!) I could be on for a record breaking tomato farm this year. I know I'm supposed to discard the weaker seedlings, but I struggle to do this when they've made such an effort to grow! 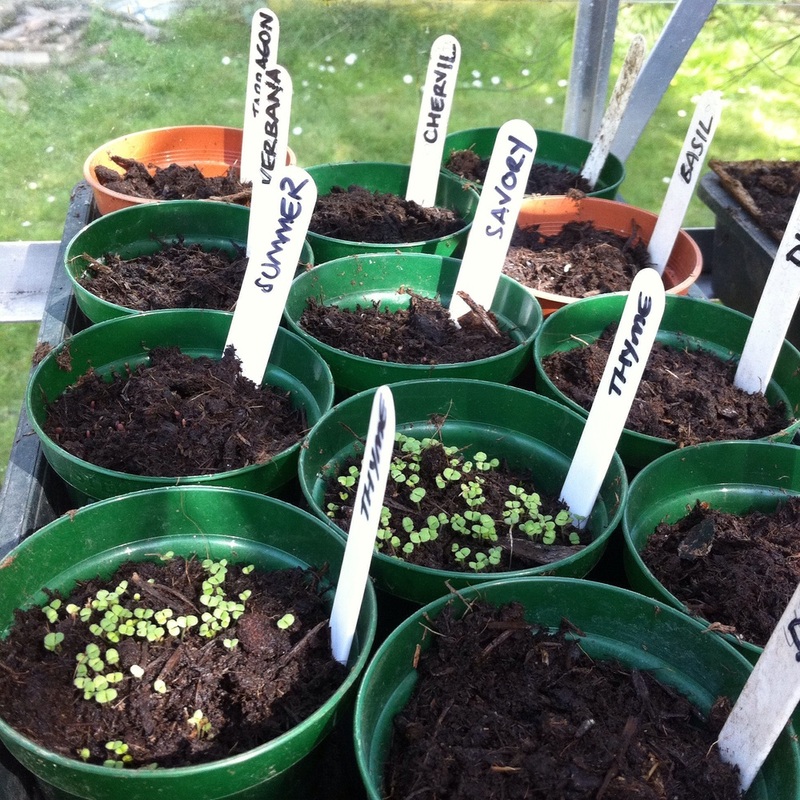 You'll also remember I had quite a few packets of herbs too, so I've sown my first batch of herbs too. I'd not grown Thyme from seed before so threw some of that into a couple of pots and that was the first to come through. The Sweet Basil is now coming along, as is the Summer Savory and the Dill, but strangely the Lemon Basil hasn't done anything yet. I've also been sowing some flowers too with zinnia's, geraniums and scabiosas, so I'm definitely making headway on all those seed packets I discovered at the start of the year! I'm not sure how they'll grow, or where I'll put them, or even what they'll look like! But I'll cross that bridge when I come to it. There's no sign of life yet from the zinnia's, but the other two are, which is a relief as I don't think I could cope with a whole seed tray of defunct seeds. In the vegetable beds the rhubarb is already doing well and I've sown some broad beans, some other beans, which I don't remember the name of but according to the packet think they're Italian - they were a new purchase from the garden centre as I couldn't resist them! There's also some lettuce, land cress, spinach and coriander but as yet nothing - it really does go to show how a greenhouse helps. There's nothing I like more at this time of year than pottering around in my greenhouse, and of course a cup of tea makes it even better! What have you got growing?